Belgium has a remarkable array of festive markets. Check your local commune or city websites to find the one nearest you or travel to some of the fine markets we have gathered for you below. After all the drama in Brussels there is nothing like the annual two kilometre ode to the festive season to cheer us up. Skate on the expanded ice-rink, shop till you drop and sip a mulled wine as you witness the dramatic light show in the Grand’Place. 27 November 2015 – 3 January 2016. Central Brussels. December is the month for giving. And with almost a hundred stalls at the Christmas market you’ll be sure to find something for everybody – from traditional and hand-crafted products through to original gifts by talented young designers. 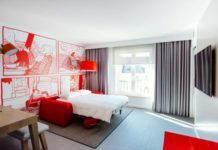 The Christmas market stretches from the Groenplaats square to the Grote Markt square and down Suikerrui street to the Steenplein. Plus a 360 ° Nativity scene which can be admired from all angles. Christmas craft market with local creators, coffee & cake and live music. Discover the beautiful handmade work of creators from Belgium and beyond. From clothes and textiles to jewellery and stationery, you’ll find perfect gifts for all your loved ones. There’s also some great coffee, homemade cakes and some vin chaud, along with live music at At 14h00 and 17h00 to get everyone in the festive mood. Sunday 13 December, 12h00-18h00. Den Teirling, Rue Maes 89 Maesstr., Elsene/Ixelles (near Flagey). Stavelot prides itself in creating the magic of Christmas with a traditional market, flea market, illuminations and puppets. The festive season really does burst into life as the abbey is once again at its very best – old and young alike can head down to the abbey’s cellars or walk under the esplanade on avenue Ferdinand Nicolay. You can find objects of elegant and sometimes unusual antiquity, or artisan decorations to put on your Christmas tree and gifts to put under it. Take a pause and enjoy a mulled wine and a hot chocolate in a warm and convivial place. Christmas atmosphere with every weekend – see the agenda on the website for more info. 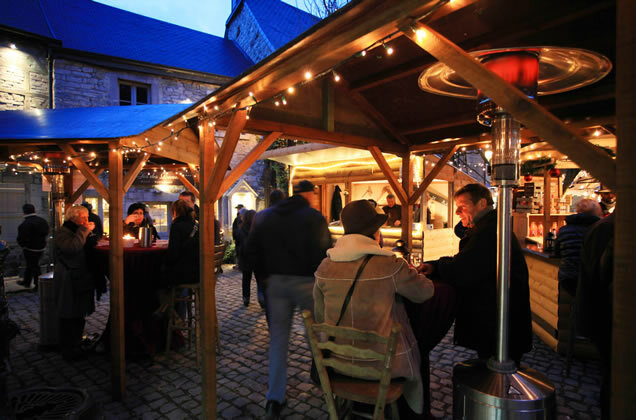 A relative newcomer to the Christmas market scene, Maredsous Abbey offers a traditional Christmas artisan market, with numerous exhibitors, original artisans, concerts and plenty of entertainment and an ice-rink. All the usual seasonal products will be present: regional produce, cured meats, artisan craftwork and gift ideas, etc. The added bonus is clearly the venue, Maredsous Abbey, which lends itself perfectly to the spirit of the Christmas holidays. The beers and cheeses help as well! Another Wallonian abbey that delights in organizing its annual Christmas events is Abbaye Saint-Gérard de Brogne where you can discover original items for the Christmas festivities in the abbey’s beautiful cloister, with all manners of gifts for Christmas. You can also taste various dishes such as pâté, jam, truffles, nougat, biscuits, speculoos and various kinds of alcohol. Saint Gérard believes that an abbey is the best place to rediscover the true magic of Christmas, a festive moment, bursting with colours and flavours. ‘The smallest city in the world’, as it likes to call itself, has a wonderful Christmas Village and Market, nativity scene and Christmas stories. You’ll find all the seasonal and gourmet produce to delight your guests. You will also find quality artisan products, gift ideas and 1,001 things to add that special something extra to your Christmas dinner table. For the children (and the big children) an ice-skating rink will be installed in the city centre. After your exertions on the rink head off to visit the Topiary Park.